Stellaroides means star-like, and these gorgeous little stars are still flowering along forest edges and in damp places as Autumn creeps in. The bright purple flowers literally glow in the shade, making them impossible to miss despite the fact that each flower is less than one centimetre big. This is a small perennial creeper with toothed leaves and tiny, rough bumps all over the plant that roots as nodes touch the ground. As you wander in the forest, the trailing stems stick to your ankles. 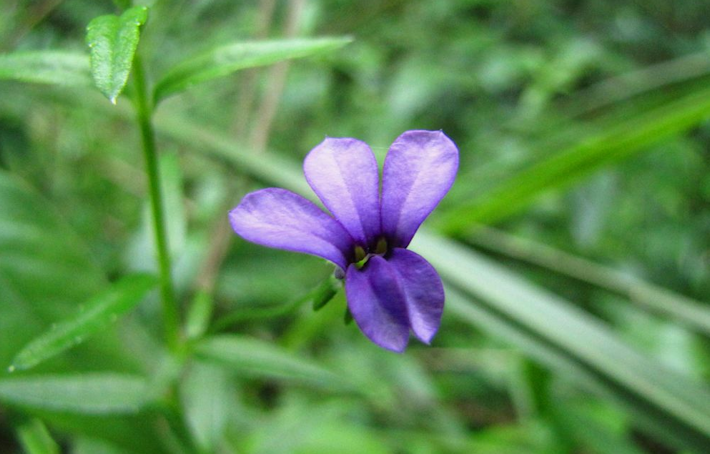 There are about 20 species of Monopsis in South Africa – part of the cosmopolitan Lobelia family – many of which have been ‘improved’ for garden conditions. Monopsis stellaroides occurs in the eastern, summer rainfall area of Southern Africa.